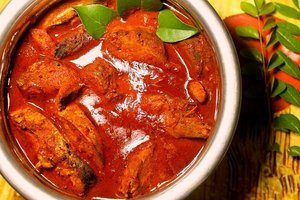 A good and easy recipe for a fish curry should be on everybody’s repetoire. This is a great one to try. Pour the rice into a small saucepan then pour in one mug of water. Stir the rice, lifting it from the bottom of the pan. Turn on the heat to full power and bring the water to the boil. Boil the water until you start to see little holes or craters appear in the rice (you may need to fan some of the steam away to see into the pan). As soon as you see these, turn the heat right down (to number 2 if you’re using electric, or just a really low heat if you’re using gas) and place the lid on. Now just leave the rice to slowly steam away. Onto the curry. Slice the pangasius into cubes on a clean plastic chopping board. Put a small saucepan over a medium high heat and pour in a drop of oil. Once hot, add the onion. Fry until it starts to soften-so about 3 or 4 minutes. Now add the ginger and chilli. Stir in about 2 teaspoons of the curry paste. Mix everything together until the curry paste breaks down and mixes into the other ingredients. Add the pangasius then immediately pour in the coconut milk. Push it down so it’s submerged underneath the coconut milk. The coconut milk will start to simmer and gently cook the fish. Cook for around 10 minutes until the fish is cooked through. Add the cherry tomatoes, a squeeze of lime and the chopped fresh coriander and simmer for another 4 minutes. Pour the curry into a bowl and serve with some rice.